This year we returned to Camp Quinipet on Shelter Island for the second year in a row. The theme of this retreat was Oratio Dominica (“The Lord’s Prayer”). So often we mindlessly rattle off this prayer without thinking about what it really means. Therefore, we thought it would be important to spend time this weekend diving into the true meaning of the Lord’s Prayer. Through talks, group discussion, prayer, and other activities we were able to gained deeper insight on the prayer. Thanks to our chaplain, Father Greg Rannazzisi, we were able to add to the retreat experience by having mass and adoration on Saturday evening. It was a wonderful weekend filled with prayer and friendship! For this retreat, we traveled to Quinipet Camp and Retreat Center on Shelter Island for a weekend of prayer, friendship and reflection. 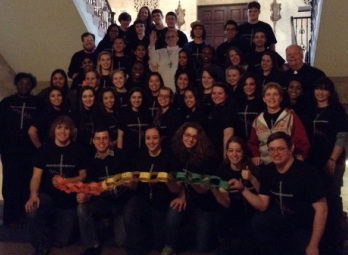 The theme of this retreat was Agape, which means unconditional, sacrificial love. This is the type of love God has for each and everyone of us and over this weekend we were reminded of that. Each member of the executive board gave a talk to stimulate conversation in small groups and encourage self reflection. We were very thankful to have Jesus present with us in adoration and at Mass on Sunday thanks to our chaplain, Fr. Greg Rannazzisi. We could not have asked for a more beautiful weekend! For this retreat, we traveled to the Immaculate Conception Seminary in Huntington, NY for a beautiful weekend of reflection, faith, and fellowship. 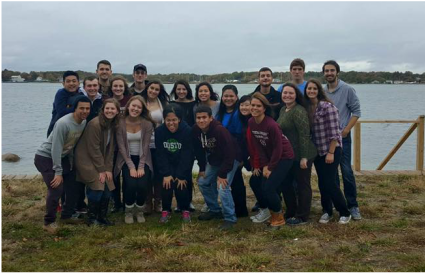 We were joined once again by Adelphi, LIU Post, and Stonybrook, creating a large and dynamic group. During this retreat, we reflected on commitment to ourselves, commitment to others, and commitment to God. Through prayer, talks, small group conversations, adoration, praise and worship, and Mass, we were all able to truly reflect on what is important in our lives and what we should be committed to. We were each challenged to be a strong link in the chain of our faith. 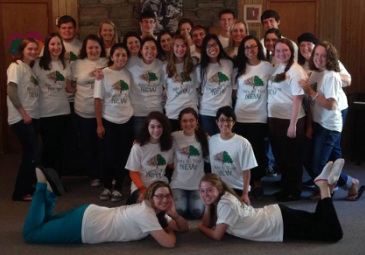 It was a beautiful and relaxing weekend away, and each student left with renewed faith and joy! For this retreat, we traveled to Putnam, NY for a relaxing weekend to be reminded that God has the ability to make all things new and beautiful in our lives. The 2013/14 Executive Board hosted the retreat with talks, games, praise and worship, adoration, and Mass. We were blessed to have our chaplain, Fr. Greg Rannazzisi, and our campus minister, Bridget McCormack join us on this wonderful weekend. We spent this weekend in October's vibrant autumn reflecting on topics such as overcoming obstacles, vocations, keeping faith in the midst of college life, and much more. We had small group discussions, one-on-one Emmaus walks, prayer, singing, reconciliation, great food, games, and bonding throughout the weekend. This weekend, each student grew in faith and love!